Do you work at Daniel Gooch? What did you think of Daniel Gooch? I like Daniel Gooch. The inside is a bit of a pit but at least they have a pool table and darts board. Daniel Gooch also does cheap Fosters. 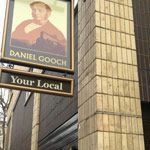 As spit and sawdust as it’s possible to get in a central London location like this, the Daniel Gooch is a ‘proper’ boozer. The Daniel Gooch is pretty enough on the outside, with black arching railings and a bold hanging sign. However, inside it’s a little gloomy with dark wooden panels on the walls and an ugly patterned carpet, although the seating – including some sofa-style chairs – keeps it comfortable. They are at least making an effort to lift the atmosphere here with Sky Sports on their large screen TV, a pool table, darts board and quiz machines. This is a pub that seems to attract mainly a core group of regulars who are, shall we say, older. Yup, an old man pub through-and-through, this is the kind of place that is testosterone-fuelled and likes it that way. A younger crowd gathers during big games on the TV but otherwise it’s pretty laid back and certainly doesn’t veer towards the pretentiousness you can find at some central London watering holes. It’s easy to see why the down-to-earth regulars gather at the Daniel Gooch. There’s a strong enough selection of high street beers with Guinness seeming to fly the flag of popularity. The real ale choice is also strong with the rather unusual addition of Black Sheep on draught, which is to the pub’s credit. Don’t ask for wine here though or a hush will descend and all eyes will turn to you. OK, not quite, but you get the idea. This is a pub for beer, beer and, when you think you’ve had enough, one more beer. Daniel Gooch has little to recommend it but it also isn’t bad enough that you should make a point of avoiding it. It is what it is and it has no intention of apologising for that. And too right, when real pubs are going out of business faster than ever before, at least those that are surviving are helping to keep it real. 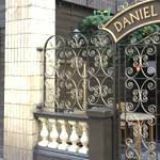 I can definitely recommend the Daniel Gooch VIP lounge to any discerning drinker wishing to have a truly unique, ye olde London Pub experience. The lounge is tastefully decorated in a mid-70s fashion with liberal use of browns and orange throughout. The cigarette burns and dried vomit adds just the right amount of character.